Hubmaster, David, wrote and asked me about a chilli jelly he had tried at work. Having an abundance of unused chillies in my training kitchen I decided to give it a go and see if I could come up with a home made version. This weeks recipe is the result . . . even my young trainees enjoyed it, so I guess it must be good! 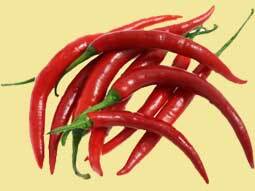 You should find it has a wonderful mild chilli flavour and a gloriously mild kick at the back of the throat. David recommends trying this jelly with cold roast pork, I suggest trying it also with any cold meats and with any cold seafoods. It went really, really well with my cold lobster this week! Very decadent I know, but one of my students brought it in for me as her father catches them and thought I might enjoy one . . . she was right! I am off now for a four hour drive across country to a birthday party . . . and will be taking jar or two with me . . . so until next week. As I have only just made this jelly this week, I have no idea how long it will keep, but I do suggest keeping it in the fridge. Rose hip syrup is something given to babies and generally available from your local chemist / pharmacy. The grenadine is added to give the jelly a light, delicate colour. If you have none add just a few drops of red food colour.